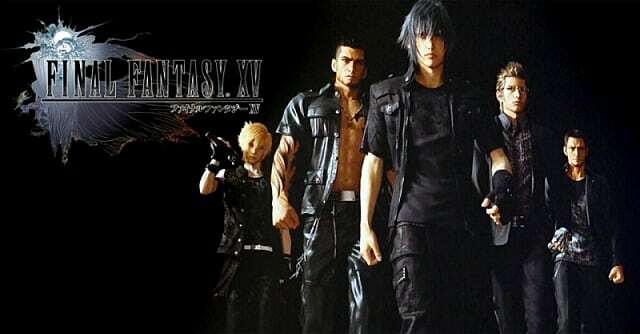 Final Fantasy XV has been out for some time now and many fans still haven't seen and done everything in the game. Going for Achievements and Trophies can help in this regard, as they act as a way to not only guide you to a game's secrets, they can add longevity and replay value. 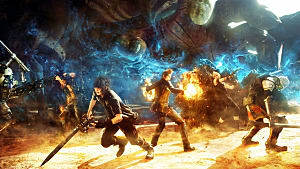 Here is a list of Achievements and Trophies for Final Fantasy XV and a short guide on how obtain the more complicated Trophies. Some are unlocked by progressing through the story and therefore are unmissable, while others are self-explanatory. How To Unlock: Unlock all other Trophies. 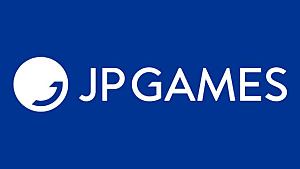 This is the only achievement that will require you to play on the 'normal' difficulty or above, otherwise you are able to play through the entire game on 'easy' mode. 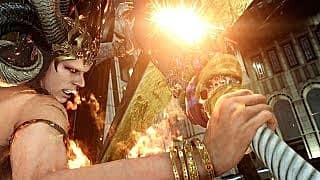 It is recommended you equip the Ice Brand weapon since Ifrit is weak to ice based attacks, then combine this with the Ignis' Libra Tech ability. Make good use of the warp point to regain MP and keep striking with the Warp Attack ability, then linking with two or three ally attacks. Repeat this over until you defeat Ifrit. How To Unlock: Play the Justice Monsters Five pinball game. The machines can be found at all Crow’s Nest restaurants and in Altissia. You aren't required to play the game, you can simply enter the game and exit for the achievement/trophy to unlock. How To Unlock: Complete a hunt. Hunts are quick side-quests that require you to hunt and kill various monsters in the game for Gil (In-Game currency). The first one can be found by accepting Takka’s first hunt at Hammerhead’s diner. To initiate the battle with Adamantoise you first need to have finished the game, you will then be asked to create a new save. Now load this save and you will appear in the rest area outside of Insomnia. 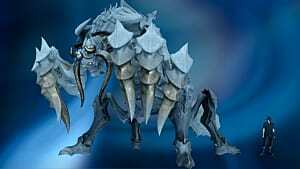 In the bed area choose Umbra and the dog will appear, ask to go to Past Lucis. When you land in the past you will get a call from Cindy, who will ask you to meet her in Hammerhead. Once you arrive in Hammerhead you will initiate the "Let Sleeping Mountains Lie" side-quest. This side-quest will awaken the Adamantoise, so you will then need to accept the "Lonely Rumblings in Longwythe" hunt, in order to begin hunting the giant. To prepare for this long battle it is recommended you are at a level 70 or above, you should also be well stocked up on healing items. Most importantly it is recommended you eat Golden Tail Soup which boosts your character HP to 4000, adds resistance and increases EXP gained by 100%. How To Unlock: Look out for the blue markers that are positioned around the field during the battle, and Point-warp to that position for the achievement/trophy to unlock. How To Unlock: During battle order one of your allies to perform a Technique. How To Unlock: Perform a Blindside attack by simply attacking an enemy from behind while one of your allies are targeting the same enemy -- this will then initiate a Blindside Link-strike attack. How To Unlock: In order to perform a Parry-Link when you are blocking, wait for a red shield to appear on screen via a "quick time event" and time your button press during this sequence to initiate a parry. 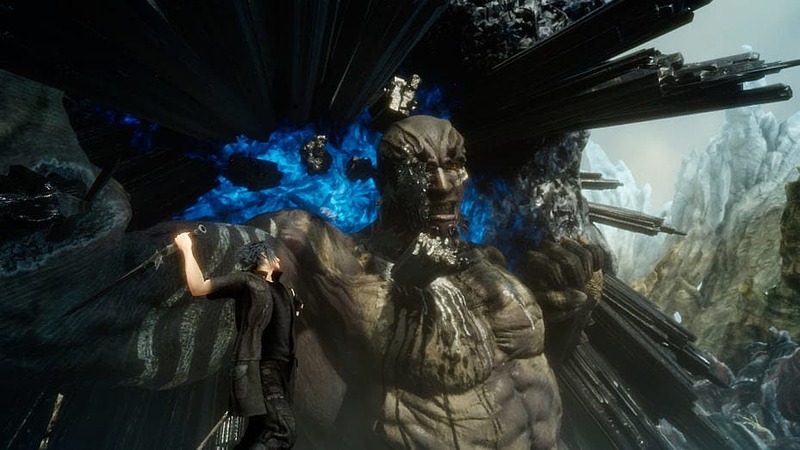 How To Unlock: Unleash Noctis’ Armiger. How To Unlock: To craft a spell once you have attained all the elemental materials, enter the Elements screen, and load the energy into a spell. How To Unlock: Summoned one of the Six for the first time. After the battle with Titan you will be able to summon him in battle, during some battles at random times (usually when your party is very hurt) you may see a button prompt. You need to hold down this button for five seconds uninterrupted to summon one of this Six. How To Unlock: Equip a weapon or a spell in all four of Noctis’ Primary Arms slots. How To Unlock: Obtain all 13 Royal Arms. The first seven of the Royal Arms are unmissable as they unlock during the story mode, but you'll need to discover the rest. YouTuber PowerPxy provided a good video guide in order get all the weapons. How To Unlock: Learn your first ability by activating with earned Ascension points from levelling up. How To Unlock: Activated 20 Ability Nodes -- See Self Mastered Achievement. How To Unlock: Activated 50 ability nodes. The quickest way to earn this achievement is by activating abilities that allow you to earn extra AP for driving, riding chocobos and fishing for example -- your characters strengths and abilities will also increase at a much faster rate by taking this approach. How To Unlock: Get Gladio’s surviving skill to 2. How To Unlock: Get Gladio’s surviving skill to 10. This skill can be achieved by running and walking over great distances. 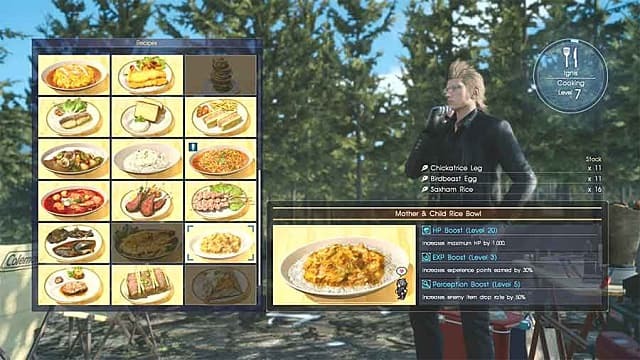 How To Unlock: Ignis’ cooking skill to 2. How To Unlock: Get Ignis’ cooking skill to 10. 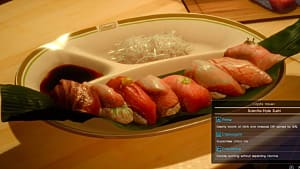 A quick method to level up the cooking skill is to purchase luncheon meat from the Lestalium and repeatedly cook the "Mystery Meat Sushi". This can be done over and over until you reach your desired level. 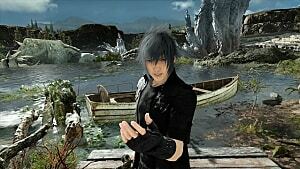 How To Unlock: Reach Noctis’ fishing skill to level 2. 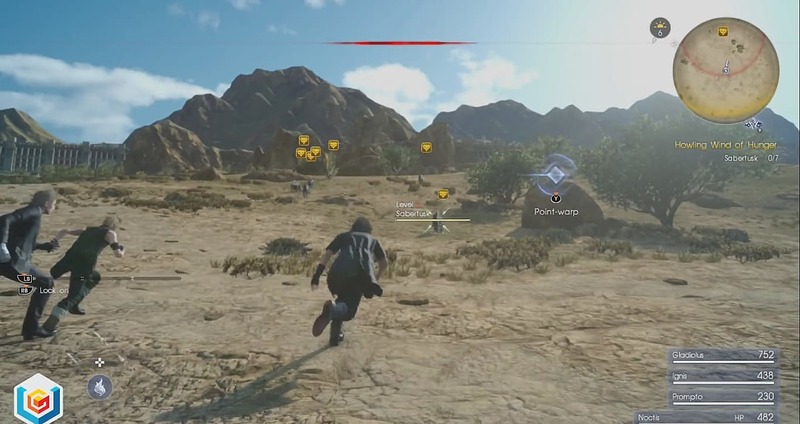 How To Unlock: Reach Noctis’ fishing skill to level 10. 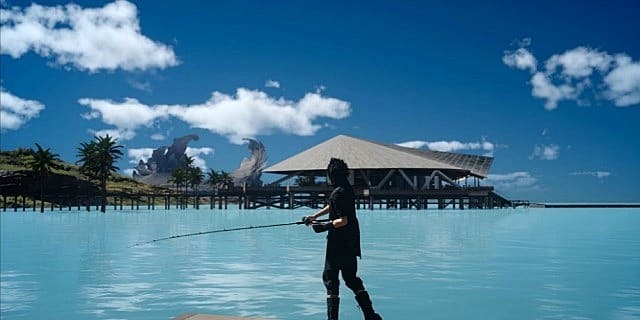 The best place for Noctis to level up his fishing skills is in the north west region of the map, in a place called Vesperpool. You will find lots of rare fish in this area but you need to remember to sleep often in order to level up the fishing ability. 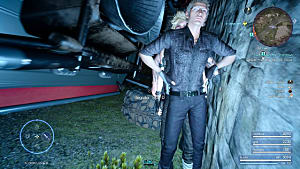 How To Unlock: Prompto’s photography skills to 2. 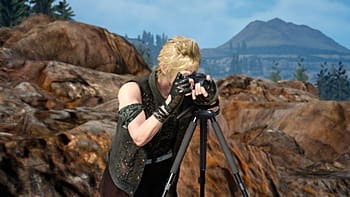 How To Unlock: Prompto’s photography skills to 10. The quickest way to activate this achievement and level up is to get Prompto to take photos during battle by equipping the Snapshot ability in the gear menu. 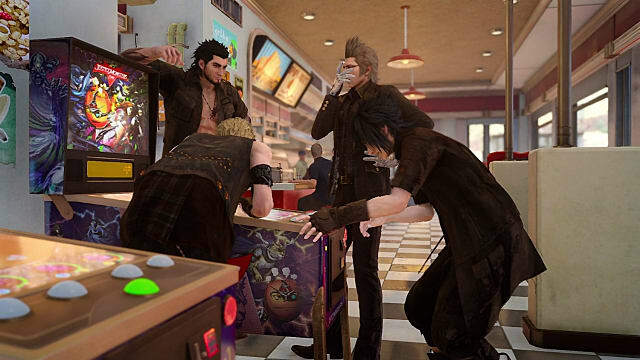 Then, have Noctis get Tech Strike, Tech Damage and Quick Tech in order to refill the Tech bar at a faster rate to allow more pictures to be taken. How To Unlock: Catch an image of Gentiana in a photo. 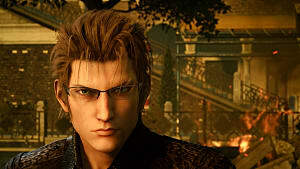 After you meet Gentiana in chapter 5, the character may possibly show up in one of the photographs at a random point in your travels. You need to make sure you scroll through all of the images after resting. The achievement/Trophy will eventually unlock when you find her. How To Unlock: Drive Regalia in manual. How To Unlock: Ride a chocobo. 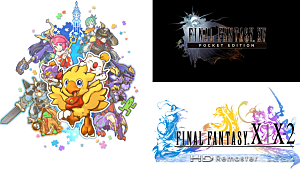 From chapter 3 onwards you need to accept a side-quest called "Friends Of A Feather", to initiate the "A Behemoth Undertaking" hunt once completed you will be able to rent Chocobos meters found at various locations in the world. 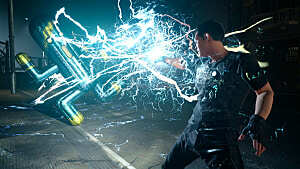 This is achieved by completing the game and loading your 'cleared game save' At a rest point speak to Umbra to return to Lucis. This will unlock a new side-quest labelled as "???" Northwest of Hammerhead. Head to that location to automatically receive the "Formouth Garrison" quest. Completing this will give you a new item and a new side-quest "Into Unknown Frontiers", which will send you to Cindy. 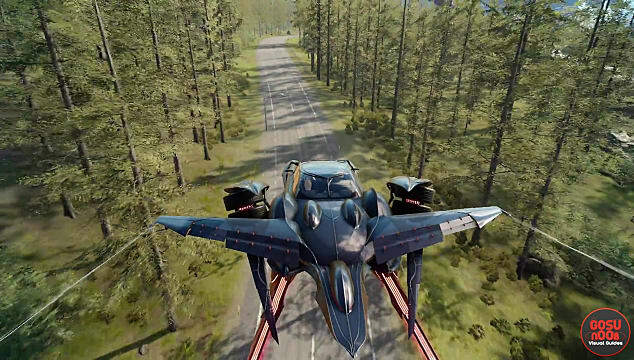 She will now upgrade the Regalia for it take flight for the Trophy/Achievement to unlock. 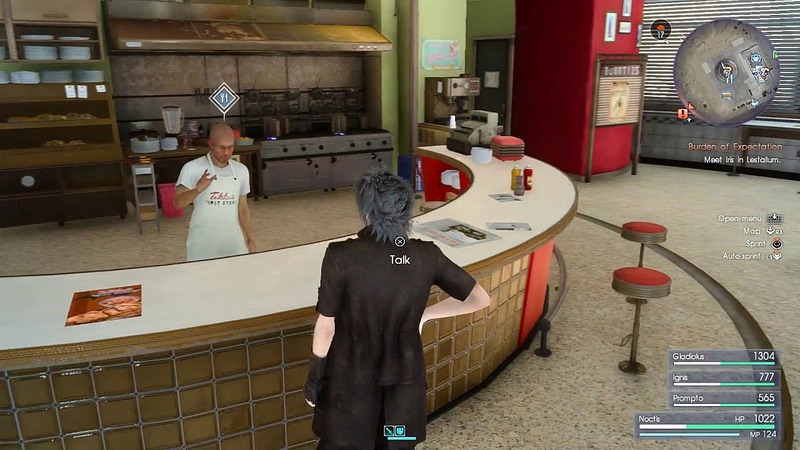 The best places to gain side-quests in the game are Hammerhead from Takka in the diner, Cid and Cindy all of which serve as means to upgrade your car, gain new ingredients and get weapon upgrades. The best area in the game though is Lestallum, where you'll find many NPC's with multiple side-quests each. As you can see the majority of these achievements/trophies can be attained just by playing the through Final Fantasy 15's main story, but there are a few that will take a little bit of work if you want the full 1000 Gamerscore or the Platinum Trophy. The only real grind is the "Weaving A Tapestry" achievement but that is more time consuming than difficult.